The American Three-toed Woodpecker (Picoides dorsalis), also known as the Northern Three-toed Woodpecker, is the only species of Woodpecker common to both Old and New Worlds. 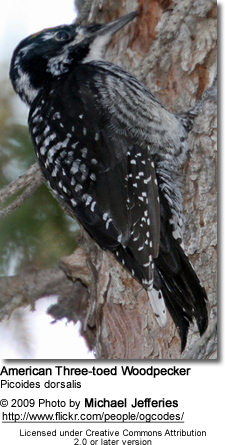 It is also the only Woodpecker species to breed as far north as it does. Until 2003, it was considered to be the same species as the Eurasian Three-toed Woodpecker (P. tridactylus). In that year, the “Three-toed Woodpecker” was split into the American Three-toed and Eurasian Three-toed Woodpecker. There are only minute differences in their appearance; the only variations are in their voices and DNA’s. The American Three-toed Woodpecker is nearly identical to the Black-backed Woodpecker and the Hairy Woodpecker in its choice of prey, habitat requirements, nesting behaviors and vocalizations. This bird is typically a permanent resident, rarely leaving its home range, but in the winter, the northern birds often can be seen travelling southward; the birds in higher elevations likewise will choose lower elevations in which to spend the colder months. They remain in their localities as long as insect-infested woodlands are accessible. They have been referred to as “tame,” “fearless,” and “exceedingly quiet.” Due to their unobtrusive nature, they are quite difficult to locate in the forest. They are not unduly cautious, but they are easily overlooked since they tends to cling to trees, motionless for long periods of time. It is also difficult to determine population counts. This species inhabits an extremely large range, so he it evaluated as “Of Least Concern.” However, the population in the U.S may be in decline due to logging and reduction of its prey. In Finland and Sweden the populations are definitely in decline. Nonetheless, in North America during the last forty years, statistics from the Breeding Bird Survey and/or the Christmas Bird Count find a significant increase in the number of birds spotted—a 100% increase per decade. Statistics differ depending on the location. The American Three-toed Woodpecker has an expansive range; he dwells in boreal North America, but he can also be found in the Rocky Mountains. His territory extends from Alaska, east across Canada, downward into the far northern United States, and finally westward into Arizona and New Mexico. There, they are found in the mountainous areas. Fewer of them dwell in the southern and eastern states, but they have been seen in the Range Plains, Great Lakes, in the Northwest, New England, Mid-Atlantic States, Utah, Minnesota and New York. This diminutive species lives and breeds in the mature, coniferous and montane forests of the boreal zone across western Canada, Alaska, and the mid-western United States. Its preferred trees are the Engelmann spruce, Sub-alpine fir, Douglas fir, Grand fir, Ponderosa pine, Tamarack, Aspen and Lodgepole pine forests. He seeks out burned, logged or swampy woodlands, the spruce of the genus Picea in particular. Following these events, huge numbers of insects infest the trees, and the Three-toed quickly follows. An irruptive species, he moves from place to place as trees become insect-infested. Should there be competition for habitat and food, he will usually give way to the Black-backed Woodpecker. The American Three-toed, however, centers his attention on the bark beetles, while the Black-backed seeks out the wood-boring beetles. Although both species are irruptive, these irruptions usually do not occur at the same time, indicating that they differ in their prey foraging. In Utah, The American Three-toed Woodpecker nests and winters in coniferous forests, settling in elevations above 2400 m (8,000 ft). Occur naturally in the Rocky Mountains - from Montana to east central Nevada, Arizona and northwestern New Mexico. Found in northwestern and central Alaska east to northwestern Canada (east to northwestern and central Mackenzie and northern Saskatchewan) and south to Oregon, northern Idaho and western Montana. Found in Canada, in northern Manitoba and northern Ontario east to northern Quebec, Labrador and Newfoundland, south to Great Lakes, northeastern New York, northern New Hampshire and northeastern Maine. The Three-toed Woodpecker is a robin-sized bird, just a little smaller than the Black-backed Woodpecker, which is also three-toed Woodpecker. It has an approximate length of 21 cm (8.3 in) and a wingspan of 38 cm (15 in). It weighs in at 2.3 oz. (65.2 g). Adults are black on the head, wings and rump, and white from the throat to the belly; the flanks are white with black bars. The back has a subtle white barring down its back amidst the black bars, and the tail is black with white outer feathers barred with black. The adult male has a yellow crown, black head, and a forehead that is somewhat spotted with dull white. The black sides are broadly barred with white, and the secondary feathers and quills contain distinct white markings. Its face is mainly black with a white stripe behind the eye which travels to the back. The throat is white, and there is a white facial stripe. Its bill is shorter than the Black-backed Woodpecker’s bill, and it appears heavy and chisel-like. Just like the Black-backed, the Three-toed has no red among its plumage. The adult female is similar to the adult male, but her crown is solid black or speckled with white. Some have streaks of grayish-white on the forehead. Immature Three-toed Woodpeckers appear similar to the adult females; sometimes they bear a slight amount of dull yellow on the crown. 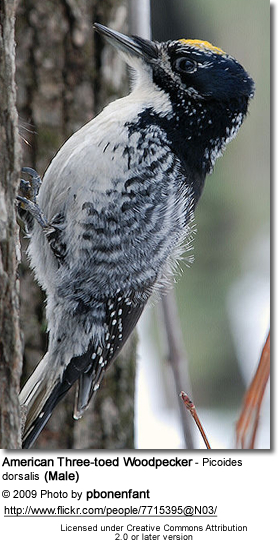 The diet of the Three-toed Woodpecker is varied; it consists of wood-boring beetles—especially the spruce-bark beetle—and their larvae, other insects, such as ants and caterpillars, the cambium of the tree, mast (nuts found on the forest floor), fruit, berries, tree sap, and sap from sapsucker-bore pits, also called wells. They prefer to forage in the spruce forests and other conifer trees, such as hemlock, lodgepole pine, and tamarack. More than 75% of their food consumption consists of wood-boring insects, mostly beetle larvae. They also enjoy the wood-boring Lepidoptera (mainly moth) larvae. Spruce beetles comprise approximately 65% of their annual diet, and 99% of their winter diet They, like the other Three-toed Woodpeckers, peel off the tree’s bark to uncover the hidden insects. The discovery of fallen bark at the base of trees gives away his location. These birds require not only live and dead trees for nesting and foraging, they benefit greatly from forests which suffer from insect epidemics. Having just three toes on each foot necessitates their finding soft wood for excavation. This morphological adaptation requires the presence of heartrot in the trees. They also need to keep up their foraging technique of pulling off the scaly bark; therefore, those trees are highly sought after. The American Three-toed Woodpecker also looks for stands of trees that have been only moderately charred by fires. During the first three years after a fire, the insect populations are at their peak; after that, insect densities decrease to previous levels, and these Woodpeckers move on to new locations. This species is one of the most important combatants in the battle against forest insect pests in the western United States. Each May, June and July find the locals in Canada, Alaska and the northwestern U.S. listening to the courtship drumming of the American Three-toed Woodpecker. He puts on quite a display to catch her attention—drumming, head swaying and calling to her. The birds search out logged areas or swamps containing spruce, larch, tamarack, pine, cedar, aspen, lodgepole pine, balsam fir, poles or various other fir trees. Decayed heartwood in live trees is also a nesting site. Both male and female will hollow out a cavity nest 1.5 to 15 meters (5 to 50 feet) above ground level in a dead or dying tree—even in a stump. They’ll choose a site near a water source, and frequently, when food is abundant, they’ll form loose colonies with others of the same species. They create an opening that is only about 4 centimeters by 5 centimeters (1 3/4 by 2 inches) in diameter. This species is monogamous, maintaining the pair bond for many years. They tenaciously defend their nest, which averages four eggs. The male will take the night incubations, and he and the female share the daytime responsibilities of brooding and feeding the young. At 22-26 days, the young fledge, but will remain with the parents for at least another month. The call of the American Three-toed Woodpecker is a rattle, and it sounds quite like that of the Hairy Woodpecker; however, the intervals between taps are longer at the beginning of calling periods. He has quite an identifiable call; it is a squealing sound, almost like that of a small mammal, and it sounds like a "quap,," “pik”, “wik,” or "quip." He is not easy to find by his call, since he is a quiet bird.